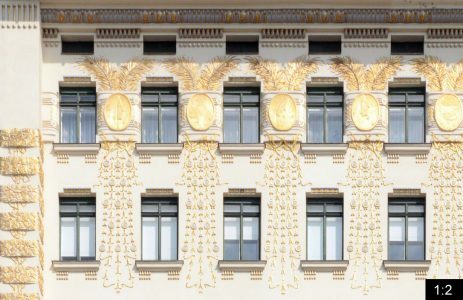 The Wienzeilenhäuser by Otto Wagner as part of a street block in the Linke (Left) Wienzeile. They are amongst the most striking heritage buildings of the capital of Austria, which itself is very rich in architectural highlights. They are situated right opposite the Naschmarkt (sweets market). The Wienzeile is a major traffic artery of Vienna and runs along the left and right sides of the Wienfluss (Vienna river) as one way streets. 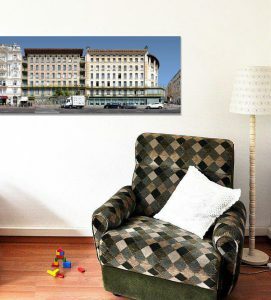 Otto Wagner, who has also been the architect behind the Vienna City Tram (Wiener Stadtbahn), strongly supported the development of a grand boulevard between the Karlsplatz and the Castle Schöbrunn. 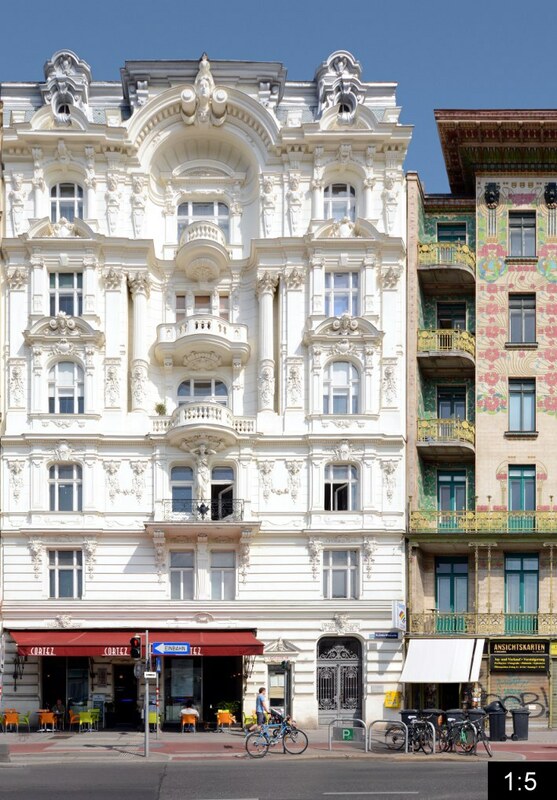 So Otto Wagner himself built three buildings on the Wienzeile, the two we see on the right side in this panorama and a third one around the corner. 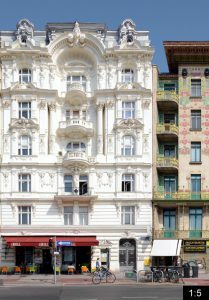 Here we see the building Wienzeile 38 on the corner and left of it the Majolikahaus (Number 40). They represent Wagner’s transition from Historicism to Art Nouveau (Jugendstil). 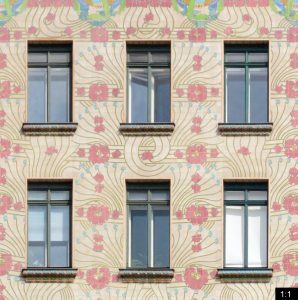 the Majolikahaus was built in 1898 and is clad in ceramic tiles with flower ornamentation by Alois Ludwig. 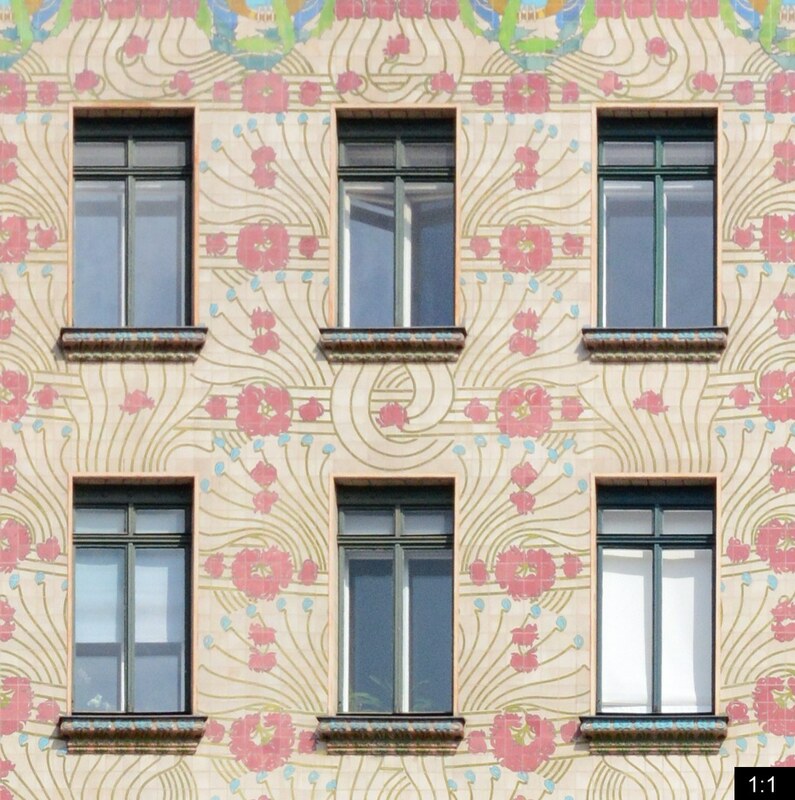 Number 38 was also built in 1898 and bears golden ornaments by Koloman Moser. The sculptures on the roof are the “Callers” by Othmar Schimkowitz.